Last Saturday morning, Country Boy woke me to tell me that one of the freezers had accidentally been turned off on (probably on Tuesday) and we had a whole freezer of cold, but defrosted food. I had been dreaming that I had just given birth to quins (5 babies). It was one of those super real dreams which had freaked me out a little, so waking to a freezer full of defrosted food didn’t seem as big a hassle as it might have otherwise. Fortunately it wasn’t the freezer with the pig and lambs that we had put in a few weeks ago, but we still had 20 portions of defrosted bacon (which we chopped up, fried on the bbq and then refroze) and a few random bits and pieces that we needed to deal with. In among the miscellaneous food items, were 5 plastic containers of apple puree. Last summer we picked wild apples from the side of the road, stewed them up, and froze them to eat with pork. 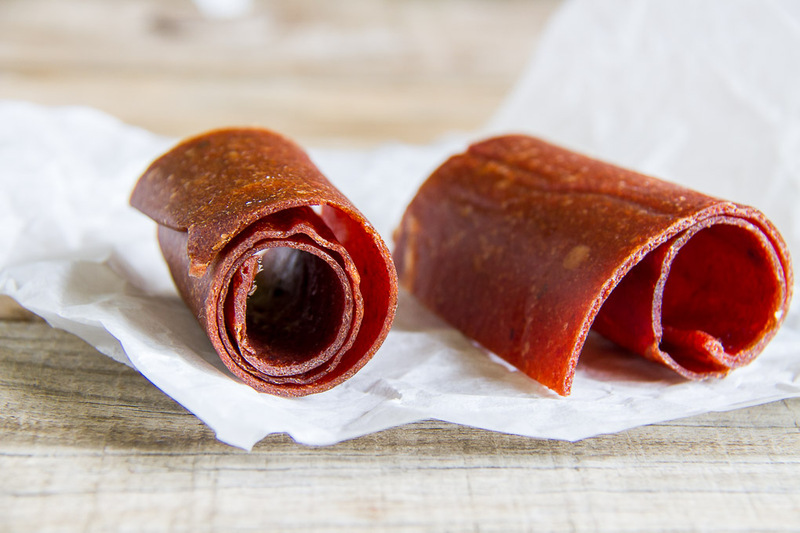 I had been meaning to have a go at making fruit leather for ages so I added a container of frozen plums for extra flavour and colour, and popped them in the oven. The kids have been taking them to school in their lunch boxes for a snack, and they seem to be a hit. 2 cups of pureed fruit - I used apple and a little plum (apple, strawberries, stone fruit all work well) - you can mix them together. Make sure your puree is super smooth by blitzing it with a food processor or blender. Add sugar and puree again. Spread the pureed fruit evenly all over the lined tray. It should be no more than half a centimeter thick. Place the tray in the oven at 60*c for a fan forced oven and leave for 4 to 6 hours until the surface is no longer sticky. Turn off the oven and allow the leather to cool. Use Scissors to cut into long strips. When deciding how much sugar to put in, remember that the final leather will intensify what ever flavours are in the fruit. If the fruit is sour, then the leather will be very sour, and if the fruit is sweet, the leather will be very sweet. I made four trays of the fruit leather, so we have plenty on hand for the kids to snack on. Have you ever had a dream that freaks you out? Had a freezer get turned off by mistake? 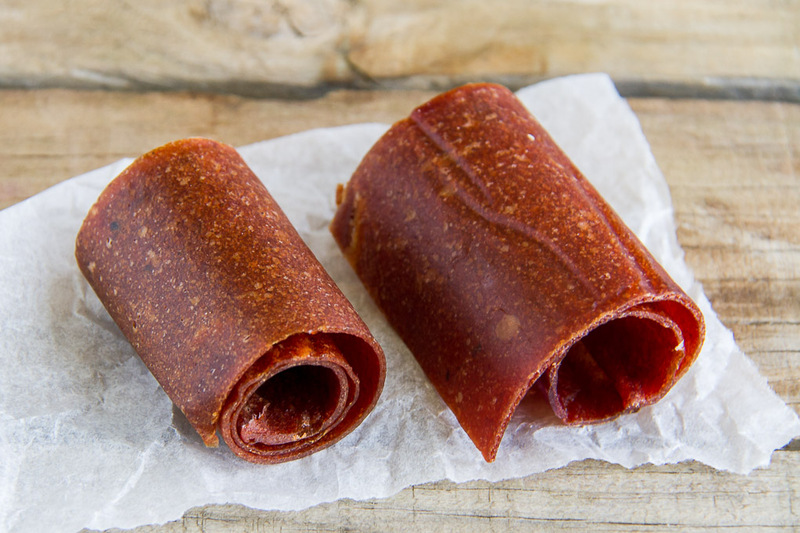 Have you made your own fruit leather? Happy to hear that you were able to save some of that defrosted food. We had that happen so many times when we had a freezer with the On/Off switch on the front of it, that we gave the freezer away. Then it kept happening to those people. If we still had that freezer, I would build a box around that switch to prevent the accidental turning off that happened when anything was pushed/brushed up against it. Fruit leather is so yummy. Do you have any mango trees? Some farmers from Qld that Hubbie & I met caravanning in the ACT many years ago had an orchid and they dehydrated strips of mango that didn’t go to market. The whole family was addicted to it. They nicely shared some with us. Very yummy. Brilliant. Thanks for this recipe. I have often wanted to make fruit leather. Oh we have just bought a little old cottage on a block filled with fruit trees, this will be a perfect thing to do for snacks for the boys. For come reason I thought I needed a dehydrator……duh me! What a fantastic way to turn a mishap into a triumph. 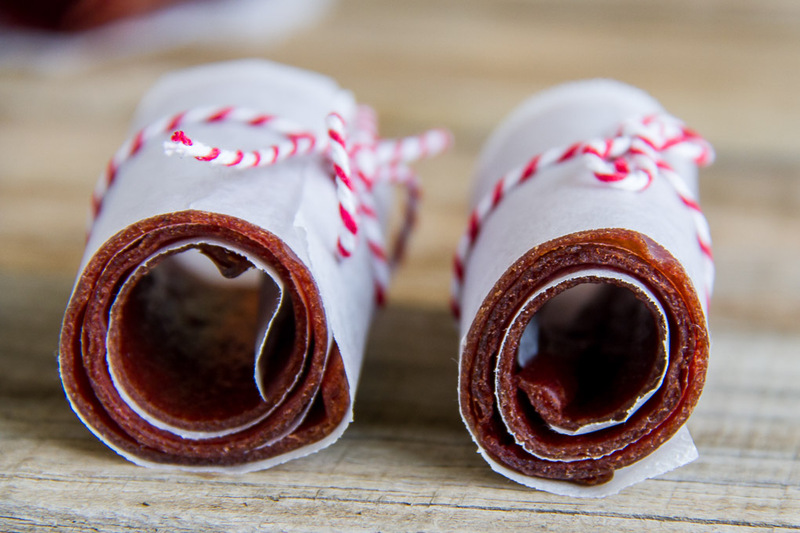 That fruit leather looks utterly delicious!